Shawn Esfahani, a naturalized U.S. citizen pictured here on Facebook, fled his native Iran in 1980 following the Islamic revolution. 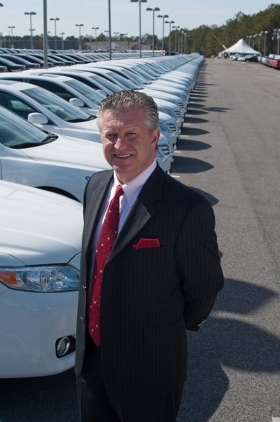 DETROIT -- A U.S. jury in Mobile, Ala., awarded Eastern Shore Toyota $7.5 million in damages this week after finding that the dealer, Shawn Esfahani, was slandered as "Taliban Toyota" by competitor Bob Tyler Toyota. "I was very pleased my case was heard and the 12 jurors did their best in handing a set of judgments to Mr. Tyler that hopefully he would stop from doing the kind of activities he's been involved in," Esfahani said in a phone interview today with Automotive News. "My only hope would be that it would be a good life lesson not only for Mr. Tyler but for other people as well that perhaps engage in tactics like this." Tyler, owner of Bob Tyler Toyota in Pensacola, Fla., released a statement Thursday saying he would appeal the decision, which came out Monday. "Our attorneys will file motions within the next 30 days to have this verdict reversed," the statement read. "We expect to prevail." Tyler also said that upon learning of the inappropriate remarks made by his employees, he took steps to personally speak with each employee to be sure the remarks would not be repeated. But Esfahani, who opened the dealership in 2008, contends his business was adversely affected. In 2008, according to figures from Esfahani's office, the dealership sold 2,602 new cars and 1,115 used cars for 3,717 total unit sales. In 2009, it sold 2,149 new cars and 1,576 used cars, for 3,725 total unit sales. Then, in 2010, new car sales plunged to 1,622 units while the dealership sold 1,582 used cars -- for 3,204 total unit sales. "It brought nothing but two-and-a-half years of stress," he said. "When you look at the natural path of growth that we had from the first year, the second year you can clearly see we were affected. We saw the military population everything but stop coming to our store." Esfahani said rumors emerged that his business was on a blacklist at U.S. military bases in Pensacola and elsewhere. Esfahani and Tyler previously met in federal court last year when Tyler accused Esfahani of violating an anti-cybersquatting provision in the Consumer Protection Act, according to a report by the Pensacola News Journal. A commenter on the News Journal's Web site noted: "Eastern Shore registered many website versions of 'Bob Tyler' in the name. Then they created web pages with actual images copied off the Bob Tyler website to make it appear that you were dealing with Tyler; only when you sent your info to indicate you were interested in a car it went to Eastern Shore." A law Web site confirmed this, stating that Esfahani had purchased 14 internet domain names with "Bob Tyler" or other variations on the name with the intent to misdirect people to his Eastern Shore Toyota Web site. The Web site also said Tyler sought $1 million in damages but Esfahani claimed that he did not know that buying the domains violated the Anti-cybersquatting Consumer Protection Act. According to the jury report, Esfahani and his companies should not have purchased the Tyler domain names. But the jury ruled that Esfahani thought doing so was lawful and thus found in his favor in that trial. Toyota's Midwest public relations did not have much to say on this week's ruling. "The matter is between the two dealers and the court has made its decision," said Toyota spokesman Curt McAllister. When asked if Toyota should have done more to address the issue, Esfahani said that he was disappointed in the position Toyota took. "Their position is that there were attorneys involved and unless they find all the facts they're not going to get involved," he said. "I'm disappointed that more was not done but I don't understand the legal side of it enough to know what they could have done where they show maybe it's just allegations." "Unfortunately two dealers in our region were engaged in a dispute with each other that led to this lawsuit and verdict. We respect the judicial system and have no comment on the verdict or possible appeal." Editor's note: Bob Tyler did not win a federal court judgment against Shawn Esfahani for cybersquatting. An earlier version of this story, quoting local media sources, gave an incorrect description of the ruling in that earlier case.